The hotel is just OK. The Baymont exceeded our expectations for price, convenience, privacy, and service. Our room was very comfortable, exceptionally clean and well equipped with a coffee pot, hairdryer and iron. Parking was close by and the area was well lit and safe. Clean well kept property, no noise, convenient location. Very nice! There's nothing to complain about! Overall a nice place but please upgrade the mapping to find this place it was very frustrating. Bad maps to locate this place. 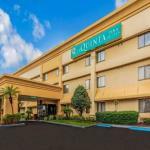 The pet-friendly La Quinta Inn Orlando South comprises 125 economically priced rooms equally suited to the business or pleasure traveler. The three-story hotel is a mile from the Florida Mall and four miles from the Orange County Convention Center. Items included with the room rate are a Bright Side breakfast, high-speed Internet access, local telephone calls and parking. Area landmarks and attractions include numerous golf courses, the Walt Disney World theme parks, Universal Studios, Gatorland, Sea World, Wet n Wild water park, the Islands of Adventure amusement park, the Florida Citrus Bowl, Amway Arena, home of the Orlando Magic basketball team and shopping at the nearby Florida Mall or the Prime Outlet Shopping Mall and Fashion Square Mall. All the rooms have an oversized work desk with ergonomic chair and high-speed Internet access, telephone with voicemail, television with cable news and movie channels, coffee maker, iron and ironing board, a radio and alarm clock and a hairdryer. This inn has an outdoor swimming pool and offers discounted passes to a nearby fitness center. The complimentary breakfast is the only meal served here. There is a Perkins Family Restaurant adjacent to the property and a Cracker Barrel, Olive Garden and an Orlando Ale House nearby. The 24-hour front desk has safe deposit boxes and information about the Orlando attractions and events. Other amenities include copy and fax services and ice and vending machines. Travelers to Orlando say this is a great place to stay. The rooms are all new, the prices very, very reasonable and the team of cheerful employees does a great job making sure everyone has a good time. The property is a little away from the tourist areas and many guests preferred the quieter location. The hotel has good access to Interstate 4 which makes traveling around the area relatively easy. Most clients have no hesitation in recommending this property to others and say they will stay here themselves on future visits to central Florida.